You've developed a clever, well-made product. Now what? Now you need some good marketing ideas for small businesses to get your product in front of customers and make it stand out from your competition. It's not enough to simply create a great product with a smart design and trust that it will sell itself. All of your marketing efforts need to come together to entice customers to buy. To get yourself in the right mindset, take a look around with a critical eye at places where people sell crafts and get a sense for who is making sales and who is not. Etsy is a great place to look because you can see statistics on how many sales someone has made and how long they've been selling. You can also check out craft shows and see whose booth is full of shopping customers and whose booth is not. Ask yourself why one person is making plenty of sales while someone else is not. It's not always the most skilled artisan or the person with the most original designs who makes the most sales (although those factors can't be overlooked). If those craft artists haven't incorporated good marketing into their business, they won't get the sales they deserve. Developing marketing ideas for small businesses requires a nice mix of logical, business minded thinking as well as a good deal of creative thinking. 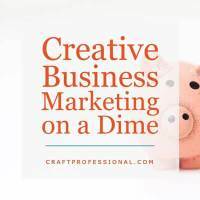 Once you have a good understanding of some of the business concepts, you'll be able to apply your best creative efforts toward developing some creative marketing ideas for your craft business. Your craft marketing encompasses everything you consciously and sometimes unconsciously do to sell your work. When done well, it is consistent, comprehensive and all encompassing. Here's what you'll find on this page. If you're in a hurry, use the links below to jump down to a specific section on this page. The better you understand your customers, their desires, motivations and expectations, the better you will be able to communicate effectively with them and make smart business decisions. Think about the person who buys your product. What is their typical age range? How would they define their style? What is their average household income? How much money do they have available for discretionary spending? What is their relationship to money? Do they like to be frugal? Do they spend a little extra money for quality investment pieces? Do they love luxury for its own sake? Who are they buying for, themselves or someone else? Why do they buy things? Why do they buy handmade? What motivates them to be your customer? When thinking through the qualities of your typical customer, it's important to avoid the trap of thinking you will sell to everyone. 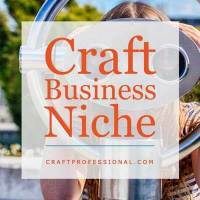 Some craft business owners mistakenly think that by appealing to a specific niche, they will lose business because they won't appeal to people outside of their niche. A small business that tries to appeal to everyone typically ends up appealing to no one. You just can't be all things to all people. If you try to do that, you'll miss great opportunities to laser-focus your business on the needs of a specific group of people. When you clearly define a specific niche of people who are your target market, you will be one step closer to making those people your devoted fans. You can become wildly adept at meeting their needs because you will be able to make all of your business decisions with the needs of those customers in mind. As you think through these marketing ideas for small businesses, you might realize that meeting the needs of your target customer will cause you to create a business that isn't in line with your work preferences. In that case, you might need to re-think the type of customer you want to target. For example, if you're like me and you love creating new designs but don't like production work, then targeting a frugal customer might not be right for you. You might be better off targeting a customer who looks for the luxury of one-of-a-kind design. On the other hand, if you find production work meditative and relaxing, you might be very well suited to create a business built around a few great designs that you update seasonally. It is very difficult to market to everyone. It is much easier to market to a defined niche of potential customers. Write a paragraph describing your typical customer. If you think better visually than in words, you could even draw a sketch of your typical customer. Now you know your customers. But before we jump into specific marketing ideas for small businesses, it's important to think about what message you want to convey. Review the characteristics you came up with, and, for each one, ask yourself how that impacts your business decisions and how you can appeal to those characteristics and expectations to entice people to buy your work. Imagine you make moderately priced, on-trend jewelry in the $20 to $30 range. Among other things, your customers are frugal and fashion conscious. Get access to and use good research on jewelry trends when you design your jewelry so you don't have to scramble to keep up with trends. 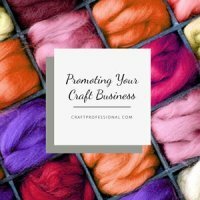 Use materials and suppliers that allow you to keep your prices low enough to meet the expectations of your target market while still making a profit. Refine your production process to be as efficient as possible to ensure you can keep prices within your customers' expectations without short-changing yourself. Develop a few great designs that you create as production pieces rather than designing one of a kind items* in order to keep your prices in line with expectations. *Making one of a kind items requires more design time and might require you to keep a wider range of materials on hand, which impacts the price you need to charge to make a profit. Look for a value-added feature that appeals to your customers' sense of frugality. Perhaps you could design a reversible necklaces, or interchangeable bead earrings so they get two items in one. Although those decisions involve the design and production process of your products, they are also marketing decisions that help you appeal to a specific target market. You would make very different decisions if you were trying to reach a different target market. The venues you use to connect with customers and the way you choose to communicate your message will vary depending again on the type of customer you want to reach. That sounds like a lot to remember, but if you have a very clear picture of the person you are trying to appeal to, it becomes much easier to make decisions about the image you want to project. Once you have a good sense of who your customer is and what you want to convey to them, you can look at some specific marketing ideas for small businesses. 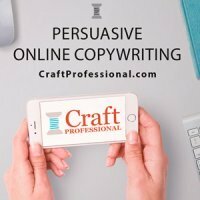 Learn the basic concepts of persuasive online copywriting so you can write to entice your online customers. Plus download an excellent 200+ page free ebook on writing to sell your products online. Working through this information will also equip you with plenty of information that will help you talk to customers. A newsletter is a fantastic way to build relationships with your most dedicated customers. You can control your newsletter more than you can control other sources of visitors to your website / online shop, and you can make real connections with customers. 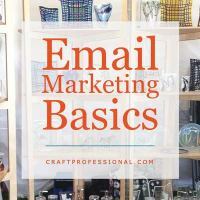 Here's how to get started with email marketing. Here are four simple techniques counselors use to develop rapport with clients that you can use to develop rapport and communicate clearly with your customers. Are you nervous talking to customers? Here's a simple formula to develop a sincere 30 second pitch that will help put you at ease, and be ready to open up a conversation with customers. Learn how to express to customers what is special about your work in a quick but meaningful way. Developing a great business network can be immensely helpful for the growth of your company, and it doesn't have to be a formal, nerve-wracking activity. 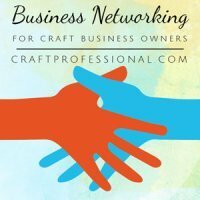 Here's how to sharpen your networking skills to make connections, painlessly grow your network, and build your craft business. Of course, no online marketing effort is complete without social media. 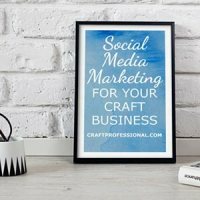 I've written several articles about boosting your business with social media over on the "How to Sell Crafts Online" section of the site. Click the link above to check out tips for promoting your business with social media. 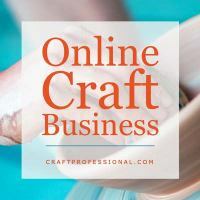 If you can go beyond simply being a potter, or a soap maker, or a photographer (or whatever medium you work with) and find a niche market for your business, you can build a community of people who aren't just customers; they become fans of your business. 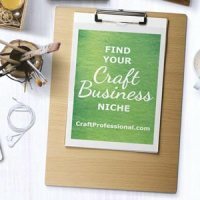 Here's how to find a market niche for your business. One way to own your niche is to be the most trusted, well informed person who is consistently first to respond to customers' needs. Here's how to efficiently stay on top of news and developments in your niche. 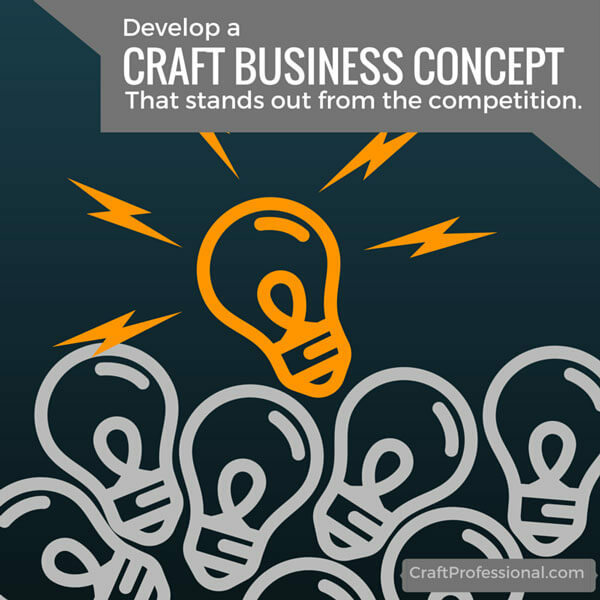 Discover how to combine your talents to develop a craft business concept that is irresistible to customers. Want to charge more for your products? 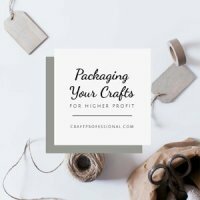 Here's how great packaging can help you raise the perceived value of your items and help you sell more crafts at a greater profit. Working out a best way to package your craft that is attractive, cost effective, secure, and not too time consuming can be tricky. 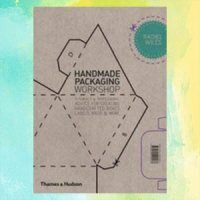 So, here's a great resource to help you develop great packaging for your products. 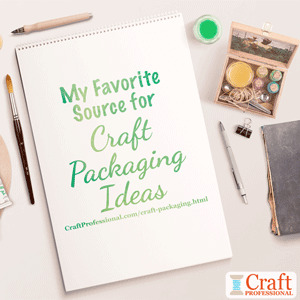 Of course, you can find craft packaging ideas online, but sometimes you just want things compiled neatly in a well-organized book to save yourself a lot of time searching. Here's my review of a book that does just that. 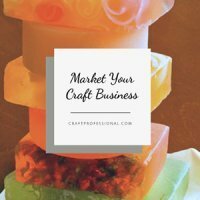 Be sure to follow my craft packaging board on Pinterest! Have you thought about creating a catalog or brochure to promote your business? Here are some tips on creating this type of marketing material. 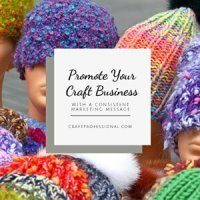 Consistent, targeted craft marketing is crucial to the success of your craft business. Do not confuse your customers! Ensure your communication is consistent with customer expectations. Your photos can truly make or break your applications for juried art shows. Here's what you need to know about getting the best photos to get into the better shows. 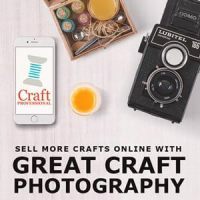 While the craft photography I see in online shops is definitely getting better, I still see a lot of photos that are clearly the cause of lost sales. 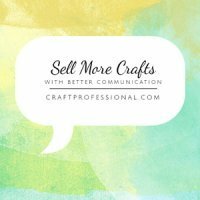 Selling crafts online, you only have your words and your photos to convince a customer to buy. Here's how to make the most of your photos for online sales. 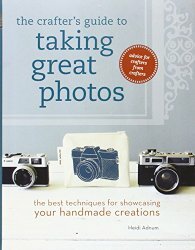 If you need to know how to take traditional craft photos - the formal style with all black, all white, or a graduated background - this book is for you. Click the link above to read my review and find out more. 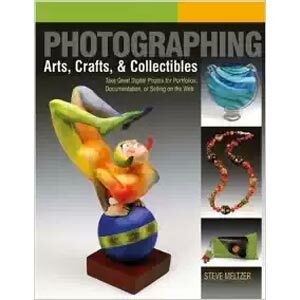 This book lays out a more modern style of craft photography typical of what you'd expect to see in a blog, or a well-styled online shop. 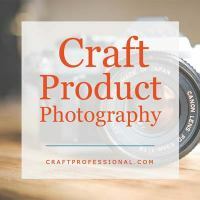 Read my review to find out if The Crafter's Guid to Taking Great Photos is right for you. Your business name sends a marketing message to customers. 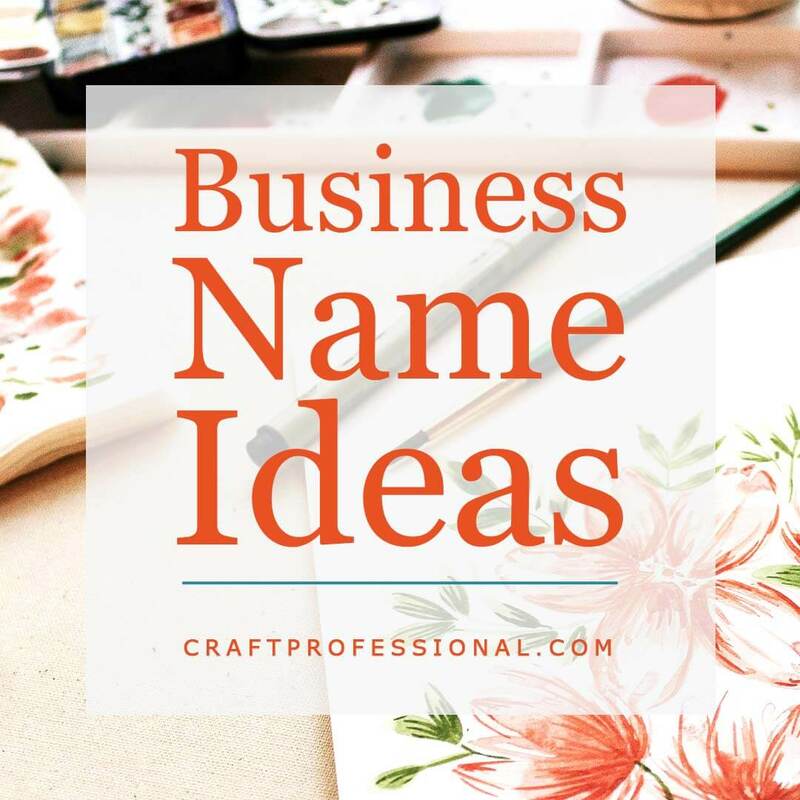 Here are several tips for brainstorming catchy business names and then choosing the name that is the best fit for your company. 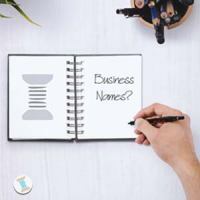 How to choose the best business name from several options. More tips on choosing the name that is the best fit for your company. 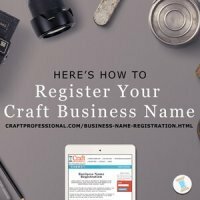 While we're on the subject of company name ideas, here is some information about registering a business name. No discussion of naming your business is complete without considering your domain name. Even if you're not immediately planning to have an online presence, you should grab a domain name that reflects your company name (ideally your exact company name) as soon as you commit to a name. 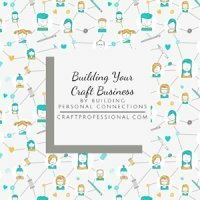 Here are several things to keep in mind when looking for a URL for your craft business website. 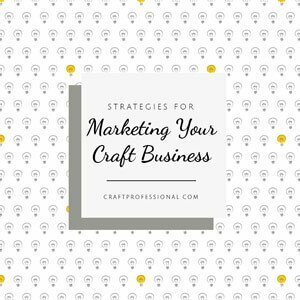 8 affordable strategies to market your craft business with time and money you can afford. Guest author Beverly Taylor describes how being prepared helps her find great opportunities for promoting her business. 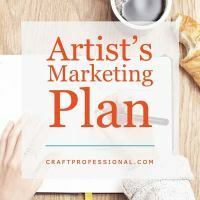 Developing a marketing plan to promote your craft business will help you stay focused and accomplish more. Without a plan, you'll jumping randomly at marketing strategies without assessing their value or creating a cohesive plan. Get organized and create a plan to effectively market your small business. Customers share their thoughts on what motivates them to buy handmade products and provide tips to help you meet their needs and expectations and sell more crafts. 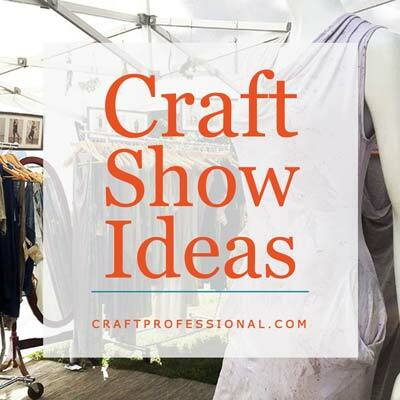 Loads of tips to help you make the most of your next craft show. 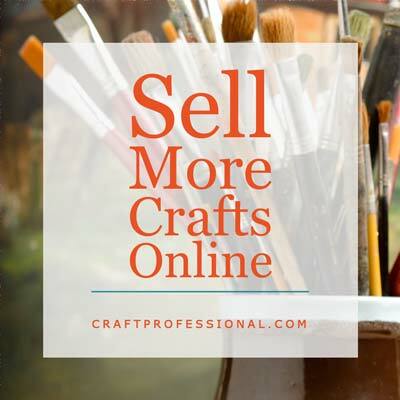 Want to sell your crafts online? Get started here. 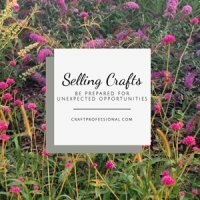 Thinking about selling at craft shows? 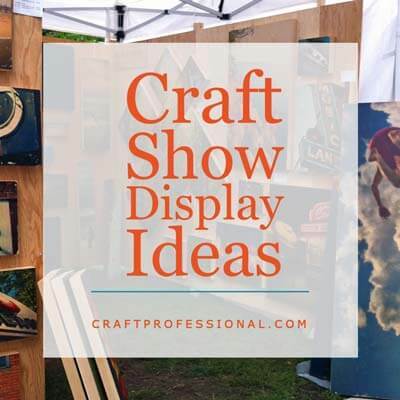 Here's some inspiration to help you create a great craft booth.